Michelle was on the phone when I entered. I didn’t know her name yet, only that she was a small, older, slightly disheveled woman with a kind face. She acknowledged my presence, and I tried to indicate that there was no rush. Still, she interrupted her call to ask me, “One slice?” and when I said yes, Michelle put that slice in the oven to heat up. I was in Jersey City’s West Side neighborhood, where I haven’t spent much time. 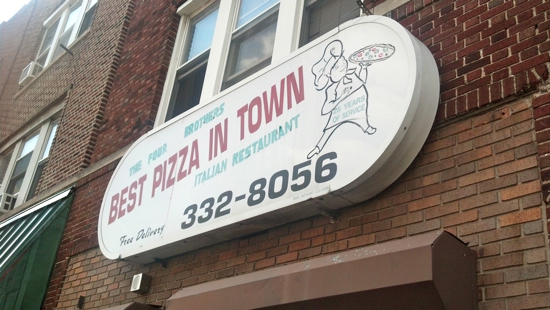 But when a destination earlier in the day placed me on West Side Avenue, I figured I should check out Four Brothers Pizzeria further down that same street. A few days ago, I’d learned about Four Brothers while researching another pizza place, and was pleasantly surprised to learn that it was still in business. So now was a good chance to investigate. Plus, it was 3 p.m. and I was starving. 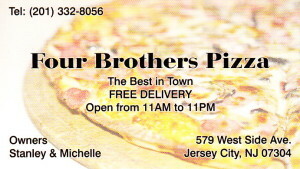 The name “Four Brothers” was really overwhelmed on the sign out front by the phrase BEST PIZZA IN TOWN. But what really caught my eye was the fading claim “25 Years of Service.” According to my research, the establishment was at least 20 years older than that. Of course, next door to Four Brothers is a bar I’d recently visited, the New Park Tavern, and there was nothing remotely “new” about that place either. When Michelle got off the phone, she fetched my hot slice, and I asked how her day had been. She explained that her husband (Stanley, as I’d later learn) was at the doctor. That’s why she was working alone today. Stanley was contemplating eye surgery—cataracts I think. I voted for going ahead with it. I asked about the restaurant’s history. Michelle said that she and Stanley had owned the place for 27 years. Prior to that was an Indian owner, and before that, the original proprietors (who we have to assume were male siblings). I took my slice and can of Coke into the back section. The front was your basic pizza-shop counter, display case, light tiles. The back was much darker, with four tables. I started to get kind of sad. There was wood panelling, plastic flowers—it was “nicer” back there—and a bar top, extending from the pizza counter, with stools placed in front. But I didn’t get the sense that very much ever went on in this room. It reminded me of old Manhattan dive bars I’d known—the kind that don’t really seem to exist anymore. They’d have these forgotten steam tables in back, from an era when bars offered free eats while you got intoxicated. Or a candy shop I once visited with an ice-cream counter that hadn’t been used in decades. Times change, and renovations are costly. So the past hangs on, dusty and neglected. Hey, wait, this isn’t Coca-Cola on my table, it was a can of Dr. Pepper. I took it back up to Michelle in the front. She apologized but I said it was okay, the colors are kind of similar. Back in the back, Michelle asked what country I was from. I said I was born here, and so were my parents, and grandparents, but before that, the Russian-Polish border. “I am from Poland!” Michelle said happily. I said I wished I knew Polish, so we could speak it together. Almost reading my mind about being the only customer in the place, Michelle said that ever since the economy tanked, fewer and fewer people came in. Layoffs, layoffs, so many layoffs, she said. “Sometimes they ask, cut slice in half,” Michelle replied. I realized that underemployed me, sitting there in the middle of the afternoon, was only further proof. Then I thought about the bar next door, and how that must be good for business, right? 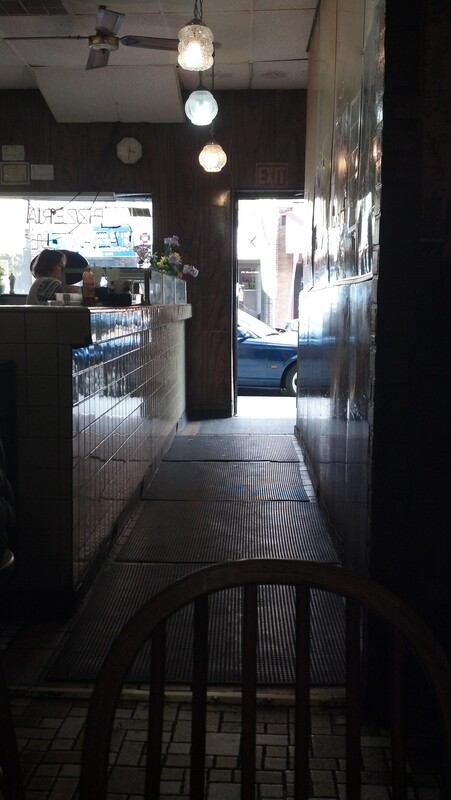 But just as quickly, I remembered that the bar was kind of famous for its hamburgers. So, not a lot of rushing out for a quick slice between beers. I went up for a second slice. 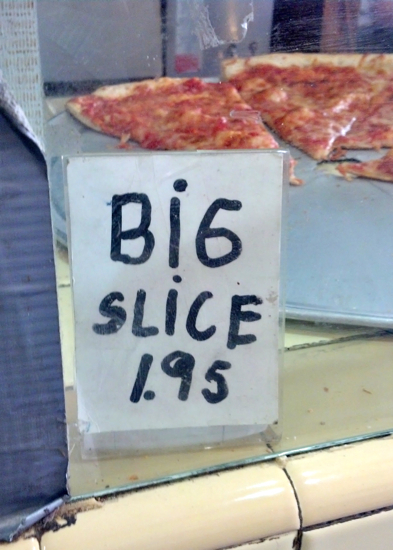 I was still kind of hungry—the slices were big, but not that big. Best in town? I don’t know, but certainly decent, with a real nice crisp crust. (“Crispy, crispy” as my regular pizzaman might say.) Maybe I just wanted to support the place, or spend a little more time with Michelle. Anyway, I still had two singles on me so I wouldn’t have to break a twenty. My change was a 2013 nickel. “Chinese?” Michelle asked quizzically, holding up another coin. I repeated myself with a little more enunciation and we had a good laugh. “Chinese people come in here,” Michelle reasoned. She then told me about being in Austria, in Vienna, and the coins she’d brought back. “They fit good in the subway,” she said with a serious face. And we laughed again. So the eye surgery is expensive?, I asked. Michelle said no, they had insurance. So then what was Stanley’s hold-up? He just had to think about it, to think it through. Sometimes surgery makes things worse. But, good eyesight was important. Important for driving, Michelle stressed. They put something in his eyes today and so he can’t drive home yet. Has to wait an hour. He would think about it for a week, make up his mind. Michelle was once scheduled for an operation. But then, she suddenly had to cancel. Never heard from the doctor again. Twenty years have gone by, and she’s fine. Still, I voted yes for Stanley. While I ate my second slice (which I’d sprinkled crushed red pepper on, to mix things up a little), business improved some. A father, mother, and little daughter came in to pick up a pie. The girl, in her dark blue “Primary Prep” dress, was all smiles. A tough pretty young woman entered, wanting two slices to go. Sunkist? No? Sprite then. “Thank you mama” she said while leaving. Backpack-toting, hat-wearing, scraggly young guy asked how much a slice cost, then ordered one with pepperoni. Frazzled woman parked a lemon-ice cart outside, pulled a wad of bills from it, got a slice. The world seemed just a little more in order. I finished my slice, tossed my paper plates in the trash can. Recycling bin? No? Coke can in the trash as well. I thanked Michelle, said it was very nice to meet her. “My name’s Jack,” I said. Didn’t make out her response. I put in one more pro-surgery vote. She then asked what my job was. “I’m a… writer?” I said without much conviction. “You’re not like other people coming in here,” Michelle said. Thought about that for a moment. “I… think a lot,” was all I could muster. I smiled, said goodbye, grabbed a business card on the way out. Splendid! I could almost smell it. I really want a slice.